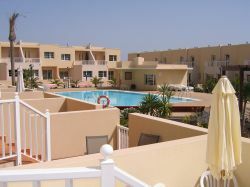 VILLAS AND APARTMENTS TO RENT ON THE CANARY ISLANDS, SPAIN. 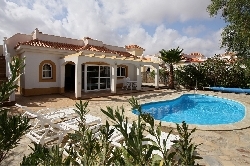 Welcome to our selection of holiday homes to rent on the Canary Islands, Spain. The Canary Islands are a collection of thirteen islands off the north African Coast and are Spanish territory. They consist of of five main holiday islands - La Palma, Tenerife, Gran Canaria, Fuerteventura and Lanzarote - and the two, small unspoilt islands of Hierro and Gomera. All the Canary Island beaches have to be of blue flag standard by law so all the beaches are well cared for. Several of the islands are of a volcanic nature. The largest of the Canary Islands is Tenerife popular for both summer and winter holidays and attracts five million tourists each year. Mount Teide is the island's volcano, the third largest volcano in the world but is now dormant with the last volcanic eruption happening in 1909. Tenerife is well known for its luxurious beaches with their golden sands and clear waters, the main attraction of the island. There are several beaches, each with their own range of different activities and many sports - both on land and in the water. There is also the AquaPark that is close by to Los Cristianos and Playa de las Americas if you want to still enjoy the water while away from the beach. Fuerteventura is the second largest island and like many of the Canary Islands is known for its many impressive beautiful beaches and hot weather as well as its wide plains and gentle valleys. Gran Canaria is the third largest island, called a "Miniature Continent" due to its diverse landscape and micro-climates. The capital is Las Palmas de Gran Canaria, a bustling city on the northeastern coast, known for its historic old quarter district and its endless selection of restaurants and bars. Lanzarote is also one of the most popular islands of the region, known for its many glorious beaches. As well as the central resort beach, there are beaches catered towards the family and those towards watersports, amongst others. If you manage to tear yourself away from the beaches, there are also a large number of varied places to do and go sight-seeing, rich in culture and history. La Palma is one of the region's smaller islands and is volcanic in nature. La Palma is known for its tranquil countryside and beaches of clear blue waters with luxurious black sand surrounded by untouched scenery is popular with tourists - the highlight of many a La Palma vacation. The beaches also offer a wide variety of entertainment and leisure activities, while the countryside provides relaxation in its picturesque towns and villages surrounded by natural beauty. Those choosing to explore the island walking will discover its magnificent sights with paths taking you all over the island. While its various water based activities include scuba diving and wind surfing. You may also want to take a boat trip in which you are likely to see dolphins and also whales too. La Gomera is the second smallest of the Canary Islands of Spain close to Tenerife. It is a roughly circular island, of volanic origin, largely made up of farmlands and mountain covered with forests or grassland. Tourists travel by ferry to the capital San Sebasti�n de la Gomera from Tenerife. 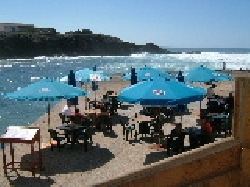 San Sebasti�n de la Gomera is the port town is in the east which also has a beach. The island is known for its spectacular views and enjoyable treks along its challenging mountain trails. Looking for self catering holiday accommodation on the Canary Islands? Then below is a selection of holiday apartments on the Canary Islands and holiday villas on the Canary Islands that can be rented direct from their owners. You can either click on each listing for further details or you can use our search engine on the left if you are looking for something in particular.